This weekend I picked up Kirby: Star Allies with hopes and expectations of the simple, charming fun that the series is known for. In the interest of positivity all I’ll say is that those expectations were not met. I considered writing about what made the newest Kirby so disappointing, but I’d rather discuss what I did with my weekend once I realized Kirby wasn’t doing it for me. I felt the need to remind myself what an incredible 2D platformer looked like. Unable to wait for the Switch port coming in May, I dusted off my decrepit Wii U to play one of my favorite games of all time: Donkey Kong Country: Tropical Freeze. The core of what makes Tropical Freeze so astoundingly well-made is the boundless creativity it exudes in nearly every aspect despite its nature as a sequel of a reboot. 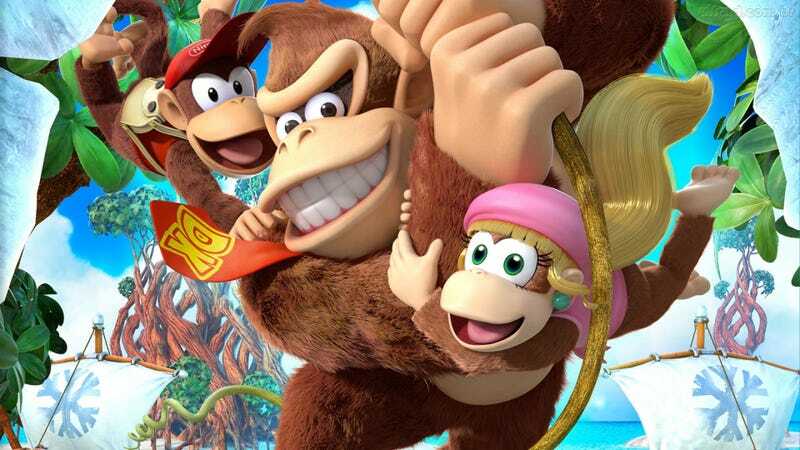 Sure, it’s the fifth entry in the Donkey Kong Country franchise and the four millionth entry in the Donkey Kong franchise as a whole, but Retro Studios used the well-known characters and setting as a starting point to create something truly special. Donkey Kong can roll, jump, and grab onto things, and his buddies Diddy, Dixie, and Cranky Kong can all grant him different movement options to traverse the perilous terrain. Sometimes the Kongs ride in a mine cart or on a rocket propelled barrel, but for the most part the gameplay remains simple and familiar. This simplistic gameplay allows the level design to be creative and complicated without feeling overwhelming, an allowance that the developers take full advantage of. Not to dismiss the rocket barrel levels, they are wonderful. No two levels in Tropical Freeze look or feel alike. Bucking the trend of less inspired platforming levels, each stage was conceived as its own idea. The six worlds all have their own settings (jungle, savanna, beach, etc. ), but each level still has a unique theme. For example, one level in the beach world has you evading the enormous arms of a giant octopus, while in another you must activate ancient underwater electronic mechanisms to progress. This allows for a substantial amount of variety in not only the visuals, but the gameplay. The basic controls never change, but the devious level design introduces new ideas in every single stage. Thanks to that consistent sense of novelty Tropical Freeze keeps you captivated right until the end, and even then it leaves you hungry for more. The silhouette levels are particularly transfixing. Fortunately, “more” is exactly what the game is willing to provide. After you beat all six joyously challenging bosses and see the credits roll, there’s quite a bit left to do. The requisite collectibles in each level actually serve a purpose, where collecting every letter of the word “KONG” in all the stages in a world will unlock a bonus, extra difficult stage. Complete all six of these stages and three final bonus levels are made available. Best these (no small feat- they are intentionally, maddeningly hard) and you will unlock the “hard” setting. This allows you to go back through each and every level with only one heart (meaning you can’t ever get hit) and no checkpoints. This mode may only be for the extremely masochistic, but it presents a juicy challenge to those that are up for it. More importantly, it effectively doubles the length of the game if you are going for the maximum 200% completion. As a final side note, it is worth mentioning that there is a full coop mode for Tropical Freeze. I only suggest doing this if you either know you will never get angry at your coop partner, or if you hate them anyway. This is not a game that is easier with two people. So hopefully this short, indulgent rant has gotten you excited about Donkey Kong Country: Tropical Freeze coming to the Switch. I’d like to go into more detail, but I’d rather keep the experience fairly fresh for any newcomers. If you haven’t played it I cannot recommend it enough. If you have, you know exactly why it’s so exciting that it’s coming to a better console. Hopefully this rerelease will give Tropical Freeze the attention it deserves, and will give the Switch a more substantial first party 2D platformer than its library currently provides.